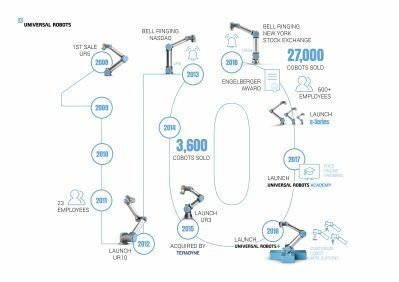 In celebration of UR's decade of pioneering cobot adoption, the company has published this infographic marking the 2008-2018 milestones. UR's co-founder and CTO, Esben Østergaard, delivered the first robot himself after having led a small team through three years of development in a basement at University of Southern Denmark. For his pioneering role in developing cobots, he was awarded the Engelberger Award, the "Nobel Prize" of robotics, earlier this year. He still remembers the early days in 2008 when the small UR team delivered the first UR5's in Denmark and Germany. "10 years might seem like a long time, and it's definitely been quite a journey; but we've only just started to scratch the surface," says Østergaard. "I continue to see our cobots power new applications that we never imagined when we first launched." Last year, Universal Robots grew 72 percent and earlier this year the company marked its 25,000th cobot sale by delivering a limited edition in gold. To date, the company has sold more than 27,000 cobots around the world. Esben Østergaard and the growing UR team launched the larger model, UR10, in 2012 and the table-top model, UR3, in 2015 -- the same year Teradyne saw the company's potential and acquired UR for $285 million. "We've been the frontrunners of collaborative robots since the term was adopted. While safety is imperative, that's simply the cost of entry into the cobot market now," says the UR CTO. "We believe that being collaborative is just as much about being accessible and flexible by placing robots within reach of manufacturers who never thought they could deploy robots due to cost and complexity." Cobots are now the fastest-growing segment of industrial automation, expected to jump ten-fold to 34 percent of all industrial robot sales by 2025, according to the Robotic Industries Association (RIA). As a first mover, UR has kept its market leader position with a 60 percent global share of the cobot market according to BIS Research, selling more cobots than all competitors combined. UR's new e-Series cobots offer more applications. As the cobot market is experiencing an increasing number of competitors, UR is keeping ahead of the curve. In June, the company launched a brand-new generation of its cobots, the e-Series, which is a platform that raises the standard for collaborative robots, and enables even faster solution development and deployment of a wider variety of applications. "As manufacturers increasingly embrace cobots, we see the need to support even more demanding applications with greater accuracy and tool integration. 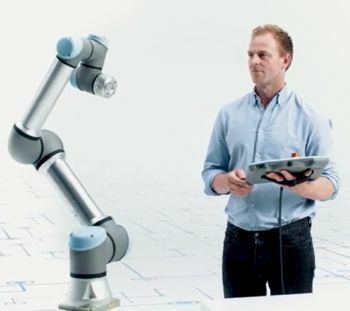 Launching the e-Series will help us continue propelling cobots forward into new applications benefitting companies of all sizes," says Østergaard.